Cleveland Clinic and Ohio University and its Heritage College of Osteopathic Medicine (OU-HCOM) have signed an affiliation agreement to develop a Northeast Ohio regional OU-HCOM extension campus to be located at Cleveland Clinic’s South Pointe Hospital campus in Warrensville Heights. Through this affiliation, the partners are addressing the growing shortage of primary care physicians in Ohio and investing a combined $49.1 million into Northeast Ohio. Ohio University’s commitment includes $36 million, which provides support for renovations to a building on the South Pointe Hospital campus and additional institutional commitments for faculty, staff and operations to provide medical education. Cleveland Clinic’s contribution of $13.1 million includes capital improvements and renovations to the building, staff and operational support, as well as medical education support. Cleveland Clinic is also committed to working to expand the number of AOA-approved or dual-accredited post graduate residency and fellowship positions. The investment also includes a $5 million grant to South Pointe Hospital from the Brentwood Foundation to support the new extension campus. In addition, the Brentwood Foundation, a non-profit, private foundation dedicated to the advancement of osteopathic medicine, is committing $6 million to graduate medical education. The Athens-based medical school has a history of training physicians who stay in Ohio to practice, and this additional site is planned to increase the number of family medicine, pediatric and internal medicine physicians who will remain in Northeast Ohio to practice, particularly in underserved urban and rural areas. The first class of 32 medical students is scheduled to begin July 2015, assuming approvals by the college’s accreditation agency, the American Osteopathic Association Council on Osteopathic College Accreditation, and the Higher Learning Commission of the North Central Association. The agreement builds upon a long-standing relationship between the two institutions, which have partnered to train physicians for the past 35 years. 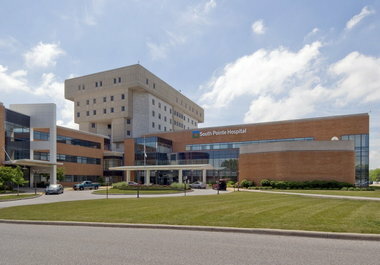 South Pointe Hospital is one of the largest osteopathic teaching hospitals in Ohio. For more than three decades, OU-HCOM students have been based at South Pointe Hospital for third- and fourth-year clinical rotations. Many OU-HCOM graduates have also completed their residency and fellowship programs at South Pointe Hospital and other Cleveland Clinic hospitals. Medical student rotations, residency and fellowship training opportunities in hospitals throughout the Cleveland Clinic health system. – Cleveland Clinic will continue to provide rotations for OU-HCOM students who complete their first two years in Athens. – This agreement does not affect OU-HCOM’s and Cleveland Clinic’s training relationships with other institutions. Engagement of more Cleveland Clinic and community physicians in a variety of specialties who, as clinical faculty members, will share their knowledge and experiences with students in Cleveland and in Athens. Encouragement of discovery through new research programs in primary care and biomedical sciences. A focus for more medical students to choose primary care as a specialty and stay in Ohio to practice. There is currently a national shortage of primary care physicians. Within the next decade, experts predict a national shortage of more than 45,000 primary care physicians. The 20 percent of Americans living in rural or inner-city primary care Health Professional Shortage Areas (HPSAs) will be hit the hardest, according to the Association of American Medical Colleges Center for Workforce Studies. Northeastern Ohio, which includes Cuyahoga, Lorain, Geauga, Summit, Medina, Portage, and Lake counties, has the largest number of HPSAs in Ohio. OU-HCOM leads all Ohio medical schools with the highest percentage of graduates practicing in primary care HPSAs in the state, and it also leads Ohio medical schools in training primary care physicians who stay in Ohio to practice. With more than a quarter of OU-HCOM’s applicants coming from the Cleveland area, a campus in Northeast Ohio gives prospective students the possibility of training there, then staying to practice. With this new site, each class of 32 students will be able to complete all four years of their undergraduate medical education in northeast Ohio, instead of completing the first two years in Athens. Students at the extension campus will have the same academic experience as those at the Athens site. The program will be based upon OU-HCOM’s Patient-Centered Curriculum, which emphasizes a problem-based small group approach. According to an economic impact report prepared by consultant Tripp Umbach, by establishing a regional medical campus in northeast Ohio, the area will experience both direct and indirect economic benefits. When the first class graduates in 2019, the economic impact of the campus is expected to be $19 million annually. It will create more than 100 jobs and generate more than $700,000 in tax revenues for state and local governments.